Cataract Surgery with the ORA System allows your surgeon to measure your eye to refine your outcomes during the procedure, rather than having to 'wait and see' as with traditional cataract surgery. “I encourage my patients to opt for the ORA measurements during their cataract surgery to ensure the most accurate strength and type of lens implant needed. This helps me to achieve the vision goals my patients expect and desire,” says Dr. Singh. In the past, the only way to measure your eye for the lens implant was in the office prior to surgery. With this brand new technology, we are able to take the ORA Wavefront Custom measurements in the operating room after the clouded cataract is removed, when the surgeon has a clear view of your eye during surgery. 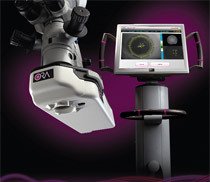 This technology is especially important for a patient who has had prior RK, LASIK surgery or has astigmatism. The ORA System helps your surgeon tailor the cataract lens implant to your individual vision needs, therefore, giving you the best possible visual outcome. The ORA System is another innovative technology Castleman Eye Center offers to eliminate or reduce a patient’s dependence on glasses and contact lenses.